Back in May I wrote THIS post. About a guy I have the pleasure of knowing. Carl Tilson. Carl has been nice enough to answer a few questions for me. Becca: What’s a typical day in the life of Carl? Carl : Not an ordinary day the amount of things I have to do to get ready for the day. I have Duchenne Muscular Dystrophy a muscle wasting condition. I have to be hoisted out of bed into my wheelchair go into the bathroom, get washed, have my clothes changed then come back into my bedroom to get fed something. I used to be able to do however because of DMD I now have to be fed by tube but I can take liquids orally. I also have to wear a ventilator which must shock some people, I use it to help expand my lungs. So yeah that’s my typical everyday routine. Becca: What makes you tick? Carl : That’s a question I get asked many of times and I hate answering this question because I’d like to give people a definite answer but can’t I guess I’m still working on that one. Becca: How well known are you in the DMD community? Carl : I would say yeah I think I’m quite well known in the community. I’ve got myself out there when every opportunity has presented itself. The more my profile rises the more publicity it brings to Duchenne Muscular Dystrophy. Becca: Apart from raising money and awareness for people with DMD, do you have any other charities that you actively support? Carl : Even though there are other good causes out there, I only have time for the one closest to home and the cause that’s most important to me which affects my everyday life. I have in the past gave money to other charities if I attend an event or something with hope they would return that favour to a charity I support. Becca: How can people help? Carl : There are many ways people can help the charity Action Duchenne www.actionduchenne.org they are always looking for volunteers who would like to put on any particular event or events to help. 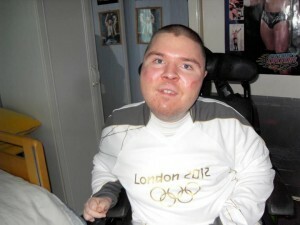 I have my own website where anyone can donate www.adtilson.com I also support other Duchenne charities Joining Jack http://joiningjack.org and Duchenne Now http://duchennenow.org. Becca: How do you maintain your enthusiasm? Carl : I have always been a highly motivated person, that’s just who I am and I’m quite a determined person that never gives up no matter how hard it becomes. I know Duchenne Muscular Dystrophy is a terrible condition but I don’t let it define the person that I am. You have to be mentally strong and believe anything is possible. The condition doesn’t like positivity it feeds off negativity so you must try to see the positive in everything you do. Becca: What are your favourite hobbies? Carl : I love watching football and professional wrestling. I support Manchester City because I come from a football mad family and my grandfather Fred Tilson played for Manchester City in the 30’s. I enjoy listening to all types of music my favourite genre is Rock music. Going out meeting people is another of my hobbies. Becca: If you could meet just one person, either dead or alive, who would it be and why? Carl : I would choose my granddad because he would be so proud of the goals I’ve achieved in my life, the determination I have shown living through adversity and how I believe in myself. My granddad was a striker so he knows that you have to take your chances. Becca: Do you have any personal heros? Carl : Let me tell you a short story about Muhammad Ali. I was at Ricky Hatton’s gym in Manchester when Muhammad Ali came over to the UK to visit. Even though he had Parkinson’s disease you could tell the same guy, who was the greatest boxer of all time, he was still the same person. There were lots of people who came to see him. I was at the back in the corner and when he was leaving he made his way towards me, his physical movements were very slow but still he was determined to go out of his way just to shake my hand. So he is my personal hero. Becca: What challenges do you face every day? Carl : Everything is a challenge from walking up every morning to going to sleep at night. Socialising and relationships, the way society see disability. 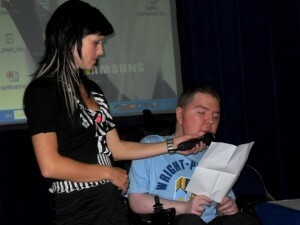 Making others understand about the condition I have and how it affects my life. Emotions run wild, depression and anxiety. Its lots of pressure, however I battle on regardless, it won’t define who I am. Becca: How did it feel to be nominated to be an Olympic Torch Bearer? Carl : This to me was a real dream come true I felt honoured to be chosen for such a prestigious event. 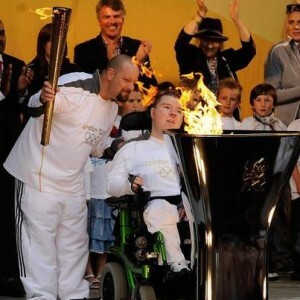 The opportunity allowed me the chance to give Duchenne Muscular Dystrophy awareness while representing the Olympic Games. Becca: What was the atmosphere like when you were carrying the torch? Carl : It was electric everyone was buzzing and when I was lighting the cauldron outside the Manchester Town Hall on the stage in front of 10 thousand people they were going crazy. What a moment it was and I almost felt like a king. Becca: What’s next for you? Carl : A cure hopefully which we are hoping will come sooner rather than later. I will carry on battling Duchenne Muscular Dystrophy and if any events come up I will keep you all posted until then watch this space. Thank you for the interview it’s been a pleasure. I want to thank Carl for taking the time out of his very busy life to answer my questions. He is real inspiration to me.